We spy uniforms in the office…must mean that it is Uniform Try-On Week! 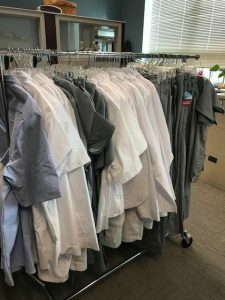 The sophomores were busy trying on their new scrubs and lab coats to get them ready for their first clinicals! Get those irons ready RoyalRNs! Once again the RoyalRNs represented Scranton at the Northwell Health Career Expo. Juniors and Seniors joined hundreds of nursing students from 21 colleges and universities across the region to learn about career opportunities at Northwell Health’s network of 22 hospitals in the NY area. Dr. Mary Jane Hanson, PhD, CRNP, CNS, ACNS-BC, FNP-BC has been elected as the Vice Chair of the Commission on Collegiate Nursing Education (CCNE). The CCNE is an independent accrediting agency that reviews and assesses the quality of baccalaureate and graduate nursing education programs and entry-to-practice nurse residency programs. Congratulations Dr. Hanson! Congratulations to the Department of Nursing’s first Doctorate of Nursing Practice graduates! Three students in our DNP program have successfully completed and defended their projects and will be awarded their Doctorate of Nursing Practice during the University’s Graduate Commencement in May. Congratulations to Dr. Andrea Mantione, Dr. Marjorie Hottenstein, & Dr. Melissa Rickard! A copy of each of their projects are available for view in the Weinberg Library. Well Done! 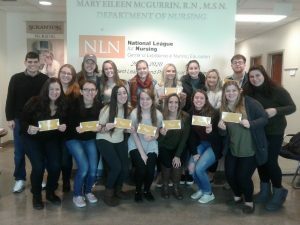 The University of Scranton’s Nursing Program has been named a Center of Excellence by the National League of Nursing, placing the program as one of America’s best at fostering learning and professional development. The National League for Nursing designated the University as a Center of Excellence in Nursing Education, one of just 15 school- or hospital-based programs to earn the distinction for 2016. It was among seven first-time recipients of the honor. The University will be recognized formally at the Organization’s 2016 Education Summit in Orlando, Florida. 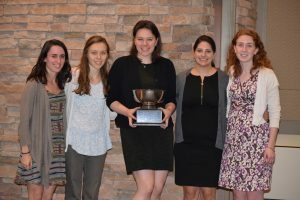 Students from the University of Scranton won the Student Nurse Challenge this spring! Teams of nursing students from area Universities and Colleges competed against each other by answering NCLEX-type questions representing different nursing areas. Congrats to our team! The trophy is on display in the Nursing Office-come check it out! Maryann Cwalinski ’16 was named a Northeast woman by the Times Tribune. Cwalinski recently completed a service trip with the Department of Nursing to the Dominican Republic. Congrats Maryann! The Department of Nursing has been awarded 2 federal traineeship grants from the U.S. Department of Health and Human Services, Health Resources and Services Administration, for the 2016-2017 academic year. An Advanced Education Nursing Traineeship grant for $348,500.00 will support graduate students in our family nurse practitioner program. These grant funds are divided among eligible students and applied directly to their tuition, thereby significantly reducing the financial burden for the students. In addition, a Nurse Anesthetist Traineeship grant for $17,827.00 will support students in our nurse anesthesia program. Since 2000, the Department of Nursing has received over 3.5 million dollars from competitive federal grant programs through the US DHHS. Mary Jane S. Hanson, PhD, CRNP, CNS, FNP-BC, professor, family nurse practitioner, and director of the graduate nursing and DNP programs, has been elected to the Board of Commissioners for the Commission on Collegiate Nursing Education (CCNE). CCNE is an autonomous accrediting agency, contributing to the improvement of the public’s health, and recognized by the U.S. Department of Education to accredit nursing programs at the baccalaureate, master’s, and doctoral levels, including programs offering distance education. As a specialized/professional accrediting agency, CCNE evaluates and makes judgments about the quality of baccalaureate and graduate programs in nursing located in colleges and universities that are accredited by an institutional accrediting agency recognized by the U.S. Department of Education. The Board of Commissioners is the final authority on all policy and accreditation matters affecting CCNE. The Board adopts standards and procedures for the CCNE accreditation process and has final authority over all accreditation actions. The Board is comprised of 13 individuals who broadly represent CCNE’s community of interest and include nursing faculty, chief nurse administrators, practicing nurses, and professional consumers. CCNE currently accredits over 700 nursing programs across the country.